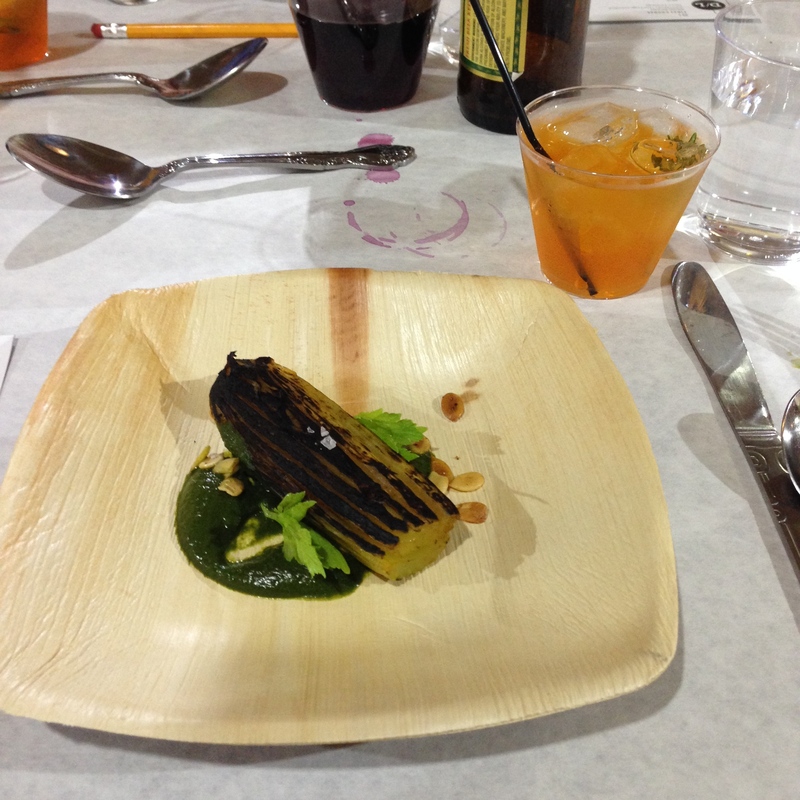 Dinner Lab – eating my way through Charm City! I am having a hard time describing Dinner Lab. So, I will let them do all the explaining: “Dinner Lab is a social dining experiment that unites undiscovered chefs with adventurous diners who are looking for something different from the conventional restaurant experience. Our events bring together a group of interesting strangers around a common table to share cuisine crafted by up-and-coming chefs from all over the country”. That pretty much says it all. It’s a pop up style restaurant – ours was in Hampden – in the old Ideal Theater – maybe most recently known as an antique store. The space was rustic – with very casual table settings. The food, however, was anything but. This is right down my alley. I love to talk to strangers. I love to eat new and interesting food. I love to drink wine. This combined all of those things: strangers coming together for a common purpose. We were lucky to have folks on either side of us who wanted to chat. We were lucky enough to have Chef Kwame Onwuachi. I may have developed a small crush on him; I actually might develop a small crush on everyone who can cook amazing food… He had an inspiring back-story and an “approachable, yet refined” plan for his own restaurant. Oh, and you should know he is only 26. I hope he opens it in Charm City so I can be a regular. We had 7 courses – and for the record – A LOT of wine. An Amuse Bouche of corn veloute – which is kind of like a puree, but a little thicker. I was really hoping for about 18 more bites of this because the fried sage and candied bacon really elevated the flavor of the corn. My neighbor at the table, was pushing the sage aside and I felt the need to tell her she was making a mistake. Without the sage, it would have been more like corn chowder. The second course was a small salad with ripe fall Hudson Valley apples, a pistachio puree and a pumpkin vinaigrette. I must say, this wasn’t the most difficult dish to prepare, but the way Chef made all those flavors work together was outrageous. I thoroughly enjoyed the meshing of the seasonal ingredients; the sweet tart apples meshed well with the sweet pumpkin. I also need to figure out how to make a pumpkin vinaigrette – any suggestions? Next, we had the celery. Once again – ingredients we all have in our house – well maybe not the melon seeds. I have never enjoyed celery more in all my life. I usually think of it as a way to cool down after buffalo wings or for some crunch in chicken salad. Chef Kwame managed to make it a star. He also made a beautiful plate. We also had a cocktail pairing, which he called the Citrus Sun. I think this might be where he really hit the mark with approachable, yet refined. Bullet rye is not really my go to drink, but he combined it with orange fanta and a little rosemary syrup. The drink highlighted the savory celery and spinach, yet the sweetness brought out the buttery notes of the sweet melon seeds. The De La Mar Stew came next – Chef managed to take sweet ripe tomatoes and turn the confit into a savory ragu with scallops, a large long neck clam and a little raw fennel. I read the description, and if we were at a restaurant I would have passed on this dish. Thank goodness, they bring everyone everything. I almost stole my friends. Our foursome’s favorite dish of the night was hands down the Fifth Course of “Steak and Eggs”. Rich beef cheeks were a deep dark black color, but still melt-in-your-mouth tender. They were plated next to a stunningly poached quail egg, both sitting on top of a velvety cornbread pudding. I think a friend of mine compared this cornbread pudding to “licking the bowl of cornbread batter at Grandma’s”. The savory and rich caramelized soubise completely rounded out the dish hitting every taste bud. When is this guy getting his own restaurant? He paired this with a strong and robust Cab Sauv from Avalon in Napa. In a smooth transition from savory to sweet, he served a upscale version of Jam and Toast. A healthy scoop of brioche ice cream on top of a brown butter piece of toast. My favorite part was the concord grape jam drizzles and the way pickled grapes added a burst of sweetness. This is right down my alley for desserts – no chocolate any where in sight. Dinner Lab is still taking members for Baltimore. Hurry, they won’t last long once the word gets out. Click here for $20 off your membership. The next dinner is October, 16. This entry was posted in Charm City, Detour, Dinner, EVENTS. Bookmark the permalink.